For the beginner, a trip to a well-stocked tackle shop is as bewildering as it is fascinating. Faced with the wonderful Aladdin’s Cave of rods and reels – not to mention all the other essential gadgets and gizmos for the modern angler – how on earth are you supposed to know where to begin? There is a magic mantra to remember when all else fails – so just keep saying “purpose and price” to yourself, and you won’t go far wrong! What Sort of Rod Do I Need? It really depends on what sort of fishing you’re planning to do. Float fishing, for example, calls for a fairly light-weight rod, typically around 12 or 13 feet in length that offers a fast and responsive combination with the light lines used. The traditional ledgering rod, by contrast, is about 10 feet long and of medium-weight and stiffness, offering the versatility to fish most of the UK’s waters and handle even quite sizeable fish. There are specialist carp rods, short rods for lure fishing – only 6 or 8 feet long and often advertised as “pike” rods – “poles”, beach-casters for sea angling, boat rods and fly rods. When it comes to picking a rod, aside of the type of angling you intend to do, budget is the other great consideration – and generally, you get what you pay for. Most rods these days are made from carbon resin, while some cheaper ones are carbon fibre/ fibreglass composites and some are wholly made from fibreglass. As a general rule, allow around £100 for a new rod – although you can pay an awful lot more if you want to! Rods can be bought for £20 or £30, but inevitably the build quality suffers to produce them at that sort of price. What Sort of Reel Should I Buy? Again, the type of fishing has a lot to do with the sort of reel you need. Although there are a number of kinds to choose from – including close-faced, centre-pin and multiplier – the fixed spool reel is firmly established as the favourite for freshwater fishing – with the obvious exception of fly fishing, which calls for its own specialist type of reel. Fixed spool reels are available in a variety of sizes to suit every combination of fish, fishing technique and water conditions – and in a range of qualities and prices. What About Reels for Sea Fishing? The fixed spool reel is well represented on beaches and boats too – though it’s important to find one which is designed to withstand the salt, which can corrode cheaper metals unbelievably quickly. Alternatively, you might like to look at multiplier reels. The name comes from the gearing system that connects the handle to the spool itself, multiplying the movement and so increasing the speed at which line can be reeled in – a godsend when playing a big fish out at sea! There are two basic types; “casting” and “boat.” The shape is slightly different, but the key difference is that casting multipliers have lightweight, low friction spools to reduce drag and allow casting over longer distances, while boat reels have strong metal spools, designed to take the strain of pulling in big fish from wrecks and reefs. The multiplier is located above the rod, rather than slung below it like other reels. As usual, quality costs – but, with a little care and maintenance, a good reel should give you many years of faithful service – so it’s worth buying the best you can. I’m Left-Handed – Any Reels Available for Me? 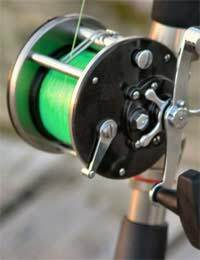 Good news – although they come set up in a traditional “righty” configuration, almost all good quality fixed-spool reels can have the handle swapped over to the other side. If you’re after a multiplier, however, you may have to search a little harder, though manufacturers are at last beginning to accommodate left-handed anglers. What About Cleaning & Maintenance? Taking good care of your rod and reel should help them stay in top condition for a very long time – if not a lifetime. Clean your rods after use – especially carefully if you’ve been sea fishing – in warm soapy water and pay particular attention to the reel fittings and guides. Many anglers keep an old toothbrush on hand for getting into the nooks and crannies to make sure there’s no dirt or grit left to cause problems later. Reels also need to be properly cleaned, removing the line to do so if necessary, and then everything should be dried down thoroughly before being stored until next time. It’s all pretty obvious stuff, really, but it can make a world of a difference. Over the course of a lifetime – and depending on how the “bug” bites – the average angler will buy a number of different rods and reels to meet the fishing challenges encountered. There are few things more satisfying than weighing up the pros and cons of all the possible combinations and then finally making your choice – at least until you land your first fish with it, that is!